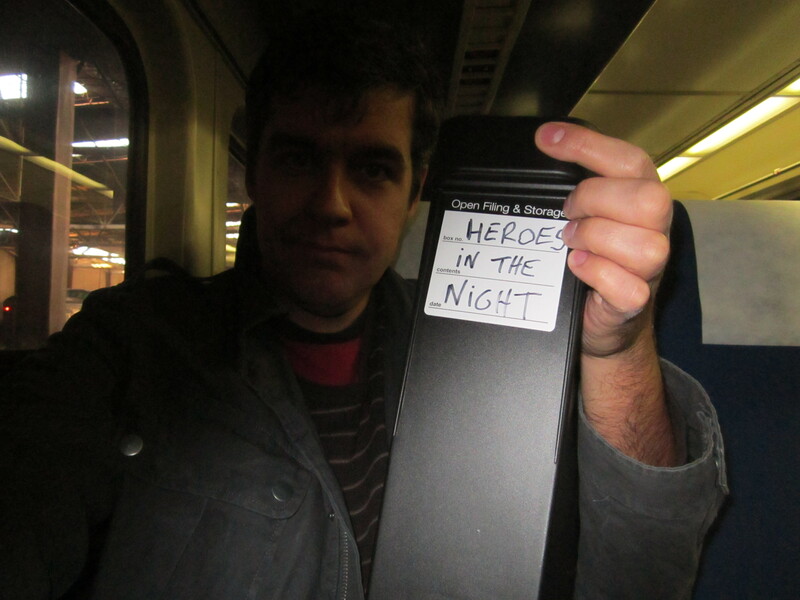 That picture is of me on the train to Chicago today to hand in my first completed book, Heroes in the Night. I got off the train and paraded around downtown and then gave it to my publisher. I could have just mailed it, but that was not good enough for me. I wanted to roll into Union Station and walk through downtown and shake my editor’s hand. These things matter. Inside that file bin is a lot of work. There is a manuscript (14 Chapters, close to 300 pages) as well as all of the photos and art on a disc and hard copy, signed permission forms and material for the publicity department. My first interview for the book was with The Watchman, March 1, 2009. My last was a follow up phone call with Phoenix Jones, November 11, 2012. In between I did hundreds of hours of interviews, research, and field work. I also read a lot of comic books. My travels for the book took me out on the streets of Milwaukee, Minneapolis/ St. Paul, Rochester, MN, New Bedford, MA, New York, Washington DC, Vancouver, Seattle, Portland, San Francisco, and San Diego. I revised the book many times. What’s next? Well, first I am going to take a day off. The book isn’t actually done, now it is in the hands of the fine folks of Chicago Review Press. They’ll slowly be going through with a line editor, the graphic design dept., and a copy editor. I’ll be working with them on any revisions they’d like to see. Then, when it’ s closer to publication date, I’ll be talking with them about publicity, media appearances, a book trailer, running excerpts, and events. That will be the fun part– I’ll actually have the book in my hand. Meanwhile, I’m going to spend the next month or so working on catching up with smaller things- I have a few articles I’m working on that I need to wrap up. After I’ve caught up, I will be writing a solid beginning base for my next book. But that, my friends, is a different story. Posted on November 16, 2012, in Uncategorized. Bookmark the permalink. 1 Comment. That is so awesome man. I’m so happy for you. A huge congratulations.